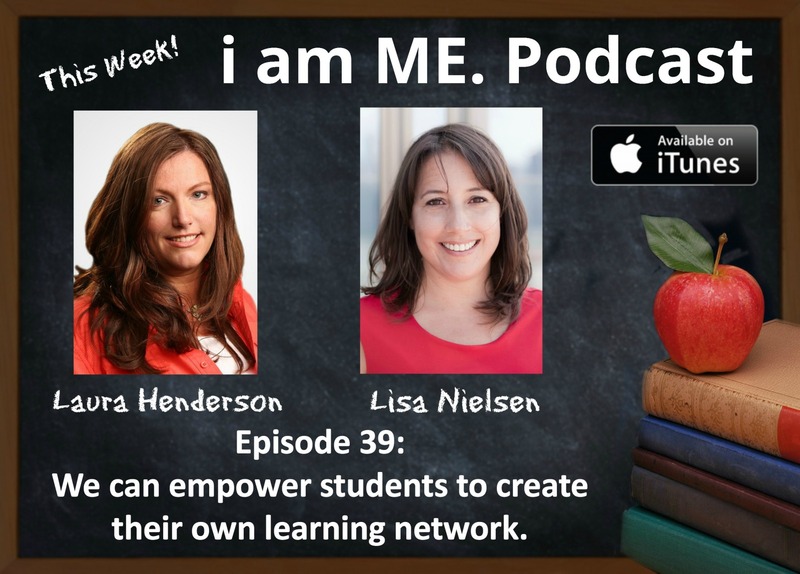 I had the opportunity to share my insights about learning in this #IamMe interview with Laura Henderson. You can check out the interview on the Epiphany Learning website where you will also find more about what I shared and resources to learn more. I've shared Robbie Samuel's ideas on 12 tips to effectively connect at education conferences. If you find those ideas helpful, then you might be interested in getting a free copy of Samuel's new book (for a limited time only) which shares ideas on how not to waste time at conferences and other events and start building meaningful relationships. You'll learn why it's important to stop thinking about what's in it for you and discover the better questions, takeaways, and goals to consider to for better results. Samuel's also explains that simply collecting business cards is not developing relationships. He shares strategies for effective follow up. He also acknowledges extrovert privilege, explains how extroverts can use that to support others, and provides advice for introverts. The book is called "Croissants vs Bagels" because it's an important concept he writes and talks about. He explains that those in tight networking circles at events are the “bagels.” If someone opens up their body language and makes space for others to join the circle--viola! “Croissant.” Set the intention to meet people and your body language will reflect your intention. If you feel anxious about networking, this book shares practical steps to help you feel empowered. The book provides clear examples of how to approach and engage people who are different from you are provided, so they’ll want to keep the conversation going. Readers will receive techniques enabling you to be more strategic, more effective, and more inclusive. You can get the free Kindle book on Amazon through July 31st. Here is a downloadable JPEG of the infographic. The #NYCSchoolsTech Summit is the largest annual #EdTech conference in New York City. At the conference innovative educators from across NYC Schools share their knowledge and expertise with other educators from NYC, surrounding areas, and even around the world thanks to social media. The conference is so popular, it trends on Twitter. There are dozens of workshops, lunchtime activities, and digital anthropologist Rahaf Harfoush is our keynote speaker. which makes it hard to choose and even harder to stay informed of all that is going on. But don’t despair. When educators connect, everyone benefits and learns even if they aren’t able to attend a particular session in person. Here is how participants (live or remote) can do just that at the 2017 #NYCSchoolsTech Summit. Tip 2 - Participate in Backchannel Conversations: You can see where and when all the backchannel conversations are taking place in Livecube right here. Introduce yourself and jump into the conversation. Tip 3 - Moderate: Ask the presenter if s/he would like you to moderate backchannel conversations and/or comments on the livestream. Whether you're there f2f or remotely, just message the presenter of a session you are interested in and offer your help. Tip 5 - Follow the Livestream: Presenters are encouraged to livestream on Periscope. You can follow this by searching #NYCSchoolsTech & #PeriscopeEdu or just click this link. If you're presenting or helping the presenter, you can read this for some strategies to keep in mind. Tip 6 - Follow The Presenters: It goes without saying to follow the presenters on Twitter and any other social media. They may have a blog where they have shared their expertise in more detail. As innovative educator Eileen Lennon says, “Learning doesn’t happen all in one day in a classroom, neither should it from a one day summit. It’s the start of a journey. You might as well take a map and a guide with you.” To make this easier you can visit the #NYCSchoolsTech Summit presenters list. Tip 7 - Storify: Offer to Storify the session you attended. The moderator will be thankful. What do you think? How do you plan to connect at this year's #NYCSchoolTech Summit? We can't wait to share and learn with you. Making its way to the top for the first time is 10 Strategies For Successfully Using #PeriscopeEdu to capture the learning at conferences. Next up is a post with ideas for inviting diversity into professional learning events and opportunities. Rounding out the top is a post that shares Tips for Connecting at Education Conferences. Find something you like? Share with others on Twitter, Facebook, email or whichever platform you like best. #NYCSchoolsTech teacher Eileen Lennon took the post I wrote on tips for connecting at education conferences and turned it into this beautiful infographic which we will share with participants at our upcoming #NYCSchoolsTech Summit. Check it out and I hope it provides some good ideas for your next learning event. Innovative educators who are fortunate enough to present at, or attend an education event, have a moral imperative to share what they are learning beyond that day and that space. There is a whole community out there thirsty for the knowledge that you had the opportunity to share and/or receive. I've shared the ABCs of Livestreaming, a comparison of livestreaming on Google, Facebook, and Periscope, and some tips specifically for Facebook Live. This post focuses on how to livestream using Periscope.TV. Downloading the app and hitting the broadcast button (if you don’t know how to do that, read this) are just the beginning. Here are ten strategies you can use to successfully livestream with Periscope.tv at education conferences. #1 Make sure your bio is tight! You have to start with you. People want to know who is sharing the news. Tell them by using your real name, real photo, including relevant hashtags and a link to where they can learn more. Here’s what my bio looks like. Next you have decisions to make. Here is the screen you’ll see. Read on to learn what to choose for each setting. You make privacy and permission decisions right when you start the broadcast. Your broadcast defaults to a public audience, but you also have a choice to share just with certain people or with a private group. A private group is perfect for a teacher who just wants to share with parents in her class. If you’re broadcasting a conference share your location. If you’re broadcasting students, that is often unnecessary. Exceptions might be if you’re filming a sporting event or theater production you want community members to attend. Here you decide if you want the world to be able to comment / chat or just those who follow you. If this is school-related, you probably just want those who follow you selected. For a conference you may want to open it up to a wider audience. At a conference, you want to share far and wide. This allows you to monetize your broadcast. Why not I guess, but it’s confusing. Read more about Superhearts from Engadget here. Next, you have to ask permission. First ask the presenter (if it’s not you) if it is okay to record. Then ask the participants. If someone doesn’t want to be recorded, make sure you don’t capture that person. Ask however, if you can capture what they may say without showing who said it. Most people are fine with this. If you’re recording students, you’ll need to be more formal with permissions. Sarah Thomas lays that out for you in her post on student privacy where she shares tips like how to limit who can comment. When you start your broadcast you have to give it a title. When you do make sure it has the conference hashtag, the session hashtag (if there is one), the handle of the presenter and #PeriscopeEdu. Oh, and make it <140 characters. During the conference, you can let those who want to follow know to search #PeriscopeEdu and #NYCSchoolsTech to view all the livestreams and then they can add in the session hashtag or broadcaster’s Twitter handle for that specific livestream. Not sure how that works? Here's an example of what it looks like when you put both hashtags to find all the livestreams. If there is a certain person who is livestreaming and you want to specifically watch what they are streaming you can do it by searching the relevant hashtags and the person’s name. Here is an example of how you would search the livestreams of Clemencia Acevedo at the #NYCSchoolsTech Summit. Periscope.tv let’s you easily broadcast in portrait or landscape mode. Rule of thumb is when you are broadcasting yourself, use portrait. When you are broadcasting something else, go landscape. The other strategy to note is you can pinch to zoom in and out. Make sure you set up conditions for success. Don’t forget to shut off notifications on your phone before you begin broadcasting. You don’t want your audience to hear those pesky tones. You'll also want to remember to bring a charger, a back up charger and maybe even an extension cord too so you can charge while recording. Binder clips are the key to avoiding shaky hand broadcasting syndrome. You can use those binder clips to make a tripod. Check out the video below to see how. Start broadcasting a few minutes before the event starts. Welcome your audience. Say hi. Ask where they are from and why they decided to join. It is kind of like a virtual invitation to your room and you are giving your audience time to find their seat and get comfortable. Let them know who you are and what they are about to see. Ask them to share your scope. It is also a good idea to have screensaver that the audience can see as they are coming on board. This might be you broadcasting the first slide in the presentation which includes presentation name, the presenter’s handle to follow, relevant hashtags, etc. If something doesn’t exist, you can just type the info on a screen or write it on a board or paper. Look how Kim Cofino from Eduro learning does that below. Pay attention to what audience members are saying and respond back to them. If you are recording a presenter in a workshop, let them know what their virtual audience is saying and invite them to respond. Of course make sure this is okay before the workshop begins. If you are recording the keynote where it is not practical for the presenter to respond, you may want to respond to the audience letting them know if you agree, additional insights, etc., but remember to whisper. When the broadcast is over provide a recap, thank your audience for joining, ask if there are any further questions or comments, let them know where to go to get more information. If you’ve used the right hashtags, this part is easy. Go to Storify and pull out the story from the day that you want to tell. 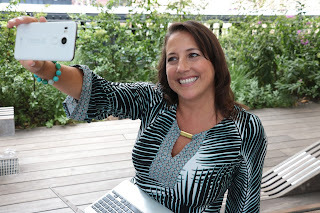 Check out how Eileen Lennon did that for the #NYCSchoolsTech Summit in this Storify. So what do you think? Are these tips ones that you will incorporate when you livestream? Have you noticed broadcasters implementing these tips well? Anything missing?